A Riesling To Die makes its debut tomorrow and we're thrilled! This is the first in our Wine Trail Mysteries that take place in upstate New York's Finger Lakes Region. Welcome to the Two Witches Winery where reluctant sleuth and winery co-owner, Norrie Ellington, is forced to find out who dumped a body in her recently planted Riesling vines. 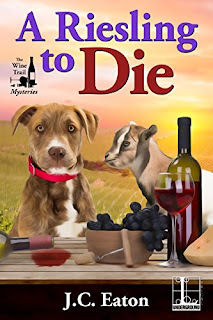 Norrie would much rather focus her efforts on screenwriting but once she starts sleuthing, she can't stop, even if it means putting herself and the winery in jeopardy. The book is available in ebook (Kindle, Nook) and paperback.